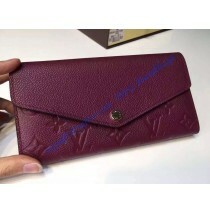 This new Louis Vuitton Sarah Wallet is newly designed to provide more compartments. 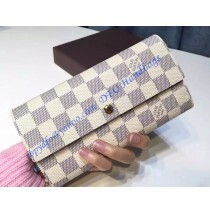 It brings together an exterior in Damier Azur Canvas and an cleverly constructed interior having a diversity of pockets and credit card slots. 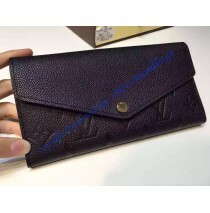 It has a massive 16 credit card slots. 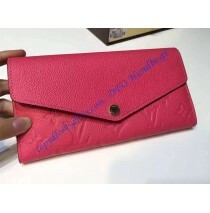 The new envelope flap is simply very gorgeous and feminine and the button is fashionable. The old Sarah wallet only has 6 credit card slots and has a straight front flap. This new wallet lets you hold as much as possible in case you doesn't choose to bring your bag sometimes. 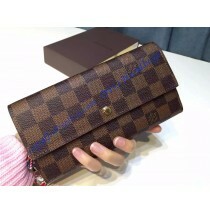 The LV Sarah Wallet features a cowhide leather lining and a couple of large compartments for unfolded bills. 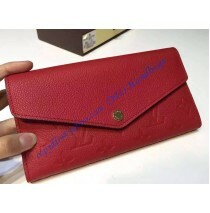 Additionally, it has a range of pockets, a zipped coin pocket, 2 flat inside pockets and an outside back pocket.